The Micro Boot and Ball Trophy features two football boots, one on either side of a football centrepiece. The football is styled in two tone gold and features a space for you to add a self adhesive vinyl or acrylic logo insert. Made from premium quality resin and coated for a high gloss finish, the trophy is set on a rectangular base with space for a FREE engraved plate. The Classic Flexx Boot and Ball Trophy Small offers a compact trophy that will meet all your small trophy needs. 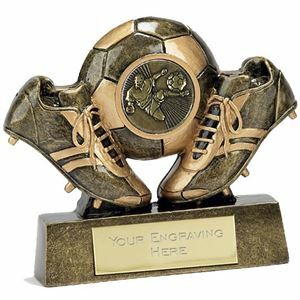 A golden football boot and ball made from premium plastic stands on a 20mm tall rectangular marble base. The Focus Mini Football Trophy is a small resin trophy coated for a high shine finish. 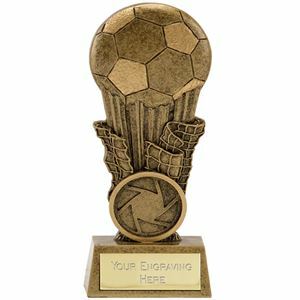 Gold coloured with net and traditional football detail, this small trophy features a football at the centre of the design. 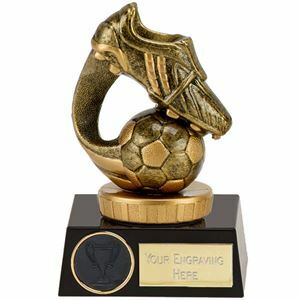 Mounted on a moulded black base this attractive trophy displays a detailed golden boot resting on a football. Finished with a two tone glaze and set on a small gold disc, the Meridian Flexx Boot and Ball Trophy offers excellent value for money. The Vista Football Cup Trophy is a small premium plastic award, displaying a round plaque decorated to resemble a football. In the foreground stands a small replica trophy formed of football playing figures holding a football aloft. Made from a quality resin the award is finished in a two tone gold glaze and can be personalised. This award is made from a premium bronze plastic and is coated with a protective glossy lacquer. 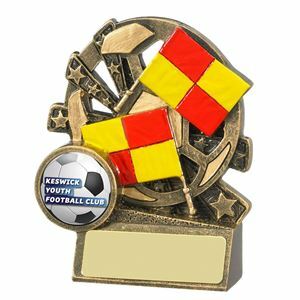 The award showcases an acrylic topped shield, printed with the image of a large football and the caption PLAYERS PLAYER printed in gold lettering. The self adhesive shield (supplied separately) is applied to the front of the Titans Football Players Player Plastic Award. 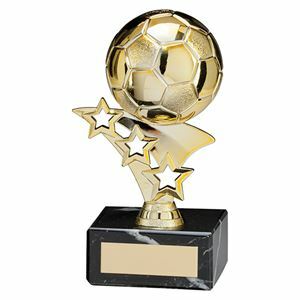 This eye catching football trophy is made from a high grade plastic which is then coated with a golden lacquer to give it a gleaming finish. The Starblitz Football Trophy showcases a golden 3D football complete with realistic markings and is set on an ornate stem with three cut out stars. The trophy is mounted on a solid black marble plinth with space to add a personalised plate. 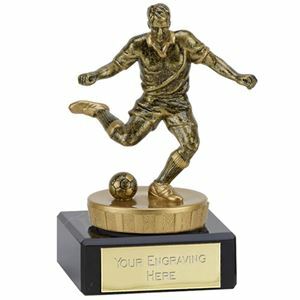 This attractive resin trophy is coated in a gold two tone gloss varnish giving a high shine finish. Styled on an angular vertical plinth, the Total II Football Trophy features a football kit shirt, a pair of football boots and a ball. 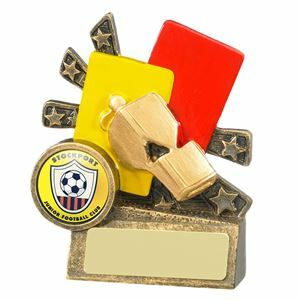 Expertly detailed with accurate markings, the trophy comes in a choice of 4 sizes and would make an ideal trophy for your football awards presentation. 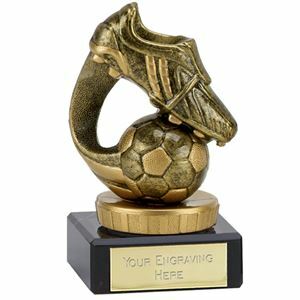 This trophy features a 2D football boot on top of a swoosh with three ornate stars of decreasing size set underneath. The Champions Football Boot Trophy is made from a superior quality plastic which has been lacquered in a high shine golden coating. The football trophy is mounted on a solid black marble base for a pleasing contrast.